The Southern Baptist Convention (SBC) is holding its annual Pastors’ Conference June 8-9 in Baltimore. This year’s event is called “Show Us Your Glory”. The SBC teaches that one must “turn from sin” and “make a commitment to Christ” in order to receive God’s free gift of eternal life. This counterfeit gospel has ensnared millions of people over the years, including many of the current16 million members of SBC –affiliated churches. The SBC teaches a false plan of salvation that is known as “bi-lateral contract salvation” or “Lordship salvation”, in which a lost person receives eternal life by promising to exchange future works (in the form of turning from sin and committing to obey and follow Christ) in addition to faith in Christ. By contrast, the Bible teaches that salvation is by grace alone through faith alone in Christ alone (see Ephesians 2:8-9). This year’s SBC Pastors’ Conference appears to be a further indoctrination exercise, as the slate of speakers and sponsors is replete with pastors who have made careers of preaching this false gospel, writing books that promulgate their heresies, and otherwise “evangelizing” the world with their false gospel that cannot save lost people and that destroys the assurance of believers. So, who are some of this year’s “all stars”? JD Greear – author and Lordship “salvationist” who believes that we must have the right “posture” toward Christ to receive God’s gift of eternal life and to prove that we have received it. Francis Chan – pastor and author of “Crazy Love”, a Lordship “salvation manifesto. David Platt – pastor of The Church at Brook Hills, and author of the book “Radical: Taking Back Your Faith from the American Dream”. In an online article from May 29, 2014, “The Christian Post” reported that membership among churches affiliated with the SBC has declined for the seventh straight year. That is great news. The bad news is that the SBC still has 15.7 million members who are teaming up with this apostate organization to frustrate grace. And, with their numbers dwindling, the SBC will be ever more tempted to join hands with other false religions in promoting salvation by works. Are All “Christian” Religions Teaching Lordship “Salvation”? It is sadly evident that virtually every “Christian religious” system ever formulated by mankind (men and women) has veered terribly from those four vital Biblical Gospel points. All “Christian religions” now seem to contain the corrupt seeds, if not the full blown growth and fruit of Lordship “salvation” (LS) as the centerpiece of their teaching. We will take the liberty of quoting from our good friend, ExP Co-Administrator, author and commenter, Bruce Bauer, and our good friend, author and commenter at ExP, John. We should use that guideline in our critique of all teachers, thus separating those who would twist or change the Truth of God’s Grace-Gift of Eternal Life in Jesus Christ alone. [John’s] comment: This is really the crux of LS. Platt says we must not only trust in Christ as Savior in order to be born again — no, he says we must also “turn from sin” (works) and accept Jesus as Lord who rules over us (implicit obedience – the promise of future works) in addition to believing. This is exactly what is being taught by Billy Graham and the SBC. Purveyors of LS have turned the Good News into Bad News! (Note: the following article is a PARODY of Lordship “salvation” through the lens of a hypothetical father, who believes in LS, as he prays for his son, who has received eternal life by grace alone through faith alone in Christ alone. It is meant to demonstrate that Lordship “salvation” is not just another slant on the Gospel. Rather it is disbelief in the Gospel. Each of the false Lordship “salvation” beliefs indicated in the prayer is referenced, with explanatory footnotes provided). Heavenly Father, I come to you today heavy-hearted. I asked my son today why he wasn’t going to church anymore. He told me it was because he hadn’t found a church in his community that he was comfortable with. I asked what he meant, since there are plenty of Southern Baptist churches (SBC) in his area. He responded that my church (and the SBC) teaches a false gospel of works that can’t save anyone. He was raised in SBC churches, and I can’t fathom who ever put that idea into his head. So, I asked what he meant by “false gospel of works.” He said that salvation is “by grace alone, through faith alone, in Christ alone” (he quoted Ephesians 2:8-9). He seemed to think that most churches add something to that – such as “turn from sins for salvation”, or “surrender your life to Christ for salvation.” He said some churches seem to be free grace, but then look to changed behavior as evidence of salvation – which is, by implication, teaching salvation by works. My son said that those add-ons had been a barrier to him understanding the gospel and accepting Christ. He said that now that he has become a believer in Christ alone for eternal life, he doesn’t want to have anything to do with churches that “frustrate grace” (he referred to Galatians 2:21: “I do not frustrate the grace of God: for if righteousness come by the law, then Christ is dead in vain”). I repented of my sins, surrendered my life to Christ, and accepted Christ as my Savior when I was in high school. I have tried to live a life consistent with my faith. I know I haven’t been perfect, but I’ve tried to be a faithful steward of everything with which you have entrusted me – including raising my children in a Christian home, making sure they attended church regularly, and teaching them the plan of salvation that I was taught. Father, my son made his profession of faith in Christ when he was a child. He was always a difficult child. He told me when he was in his twenties that he “gave his life to Jesus.”3 I was overjoyed, but his commitment to Christ didn’t last very long. I know he has drifted, and has not ever really been a consistent churchgoer. Father, only You know whether my son ever truly surrendered his life to You, sincerely repented of his sins, and trusted in Christ. 2 James 2:19 is often used by Lordship “salvationists” as a proof-text that believing in Jesus is not enough for receiving eternal life. This is not true. Demons are not eligible for receiving salvation, nor does this passage say that demons have faith in Christ. 4 The son is not in error or deceived. The father is. There is absolutely nothing more to receiving eternal life than believing the Gospel and accepting Christ as Savior. 5 Following Jesus in discipleship will not result in eternal life, nor is a discipleship a condition for receiving eternal life. 6 “Willingness to turn from one’s sins” is not a requirement for receiving eternal life. A friend of mine recently brought me a parenting magazine he had picked up from his Southern Baptist church. He pointed me to an article entitled “Should We Stop Asking Jesus into Our Hearts?” The article was a series of excerpts from the book of the same title; written by J.D. Greear, lead pastor of the Summit Church in Raleigh, NC. In reading the article, I was reminded of a couple of old adages. The first adage is “the devil speaks with a forked tongue.” Greear aids and abets the evil one by mixing Biblical truths with his LS-slanted opinions and quotes from other shameless promoters of LS, including Charles Haddon Spurgeon. Like virtually all Lordship “Salvationists”, Greear pays lip service to belief in the Gospel, but then betrays that belief by what else he says. Greear’s definition of repentance to include “reversing your direction” is code for turning from sins for salvation, making Christ Lord of your life for salvation, and so on. He repeatedly uses the term “posture” toward Christ (I counted at least six) as a way of expressing this flawed belief system. The word posture is never used in the New Testament. “…I would ask them if their present posture is one of submission to Christ’s Lordship and trust in his finished work. If so, they are saved, even if they don’t remember the prayer or the moment they got into that posture. Greear reveals, with these comments, his errant belief that discipleship and evidence of a changed life are requirements for salvation. My friend who brought me Greear’s article did not buy into it. But, the article is indicative of the kinds of false information that millions of people are being fed in their churches every week. In fact, Greear has received glowing recommendations from a veritable “who’s who” of Lordship “salvationists”, and is a prominent leader in the Southern Baptist Convention. 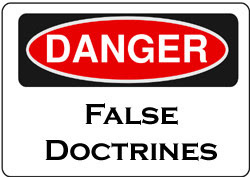 We must pray for those who preach the gospel faithfully, and be vigilant in exposing false doctrine and false teachers.